Can I be honest for a moment…sometimes when I sit down to write I only have a vague idea of what I am going to write about. I might have a starting point or I might have a verse, but a lot of the time I really don’t know what I am going to write. You see I write as a time of devotion and reflection with my Father God. He sews a tiny seed of an idea in my mind and I meditate over it, and allow God to speak to me in the form of writing. I have a lot of “WOW, Yes God!” moments during these times! I write because I need God to speak to me. I write because it is a method of communication between my Father God and me. I write because it is the way in which I process what my LORD is teaching me. It is my passion. It is my dream. It is the world I can become lost in for hours and emerge renewed. I write because it is how I reflect Jesus and all He is teaching me. My blank canvas looks a lot like Lysa’s – the final product, not so much!! A finished canvas needs a gallery and that’s what my blog is. It is the gallery in which I store my writing. It is my dream that others might be encouraged by what the LORD is teaching me, and so I share. I share knowing that somebody might take a passing glance. I share knowing that somebody might sit down and stay a while. I share knowing that somebody might find my work ugly or offensive. I share knowing that a life might be transformed. I share because I love the LORD and all that He is teaching me. I could write for days about the take-away points from the Conference and highly recommend attending next year! During a break out session on Blogging I was challenged to move my blog to the next level and the dream was born to have my own website…join me tomorrow as I continue this dream and watch it hit a speed bump! How does the LORD speak to you? How do you record the messages He places on your heart? Welcome to my “31 Days to Dream” and thank you for joining me on this journey. I don’t hold the road map for October–God does! He is starting the journey by taking me down a path of memories, some of which I had long forgotten. He is showing me how He has made my childhood dreams come true in ways that I could never have imagined. He is giving me FAITH and HOPE for the road ahead. 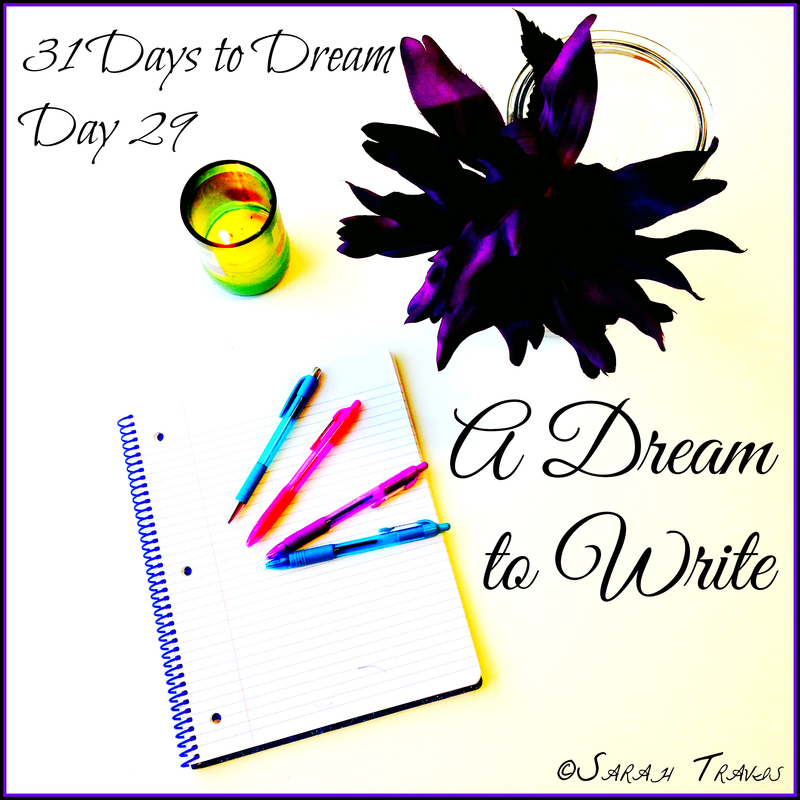 I am excited to see where He leads my dreaming over this month of #Write31Days 🙂 You can find my other 31 Days to Dream posts here! Reading your thoughts on writing was like looking in the mirror. I have to write to dig deeper into my relationship with God. Praying is great. Studying the Bible is great. Serving is great. But writing alone slows and traps my thoughts and open doors for me to record what God speaks to my heart. You’ve got me intrigued about She Speaks. I’m praying for the opportunity to do something like this, so that God can push me to the next level of his higher plan. Thanks, Sarah! Yes. To everything. The writing as a “have to”, a “need”, and a “soul thing”. Sometimes, with no plan what-so-ever! …and sometimes with a plan that changes as I write!!! This is exactly how I write! I never have a plan until it all comes pouring out. Thabks for putting that into words! I love to write, but when I read about people having this passion and dream for writing – I don’t think that’s me. I love it, but it’s not a burning that I must do or else. It’s interesting to read the passion that you have. I love your statements on writing….Writing because you have to…writing to reflect Jesus. I often discover what I am thinking and feeling as I write, definitely a way God teaches and leads and reminds me. I can relate to so much of what you had to say today! Wonderful post! Someday I hope to go to a writing conference. You have inspired me to check this avenue of growth out. Susan, I went to the Proverbs 31 Ministries She Speaks conference this year and it was incredible! I already have the dates in July 2015 in my calendar! When and where is the conference next year? Praying for God to continue to equip you and fill You with His words to teach, inspire, encourage and convict others as they walk with you on your journey to doing deeper still with God in His Word and in prayer.